National Progression Awards (NPAs) assess a defined set of skills and knowledge in specialist vocational areas, linked to National Occupational Standards. The NPA in Creative and Digital Media: Technologies, Processes and Practices at SCQF level 6 introduces learners to technologies, processes and practices that are important in the creative and digital technology sector. This NPA develops knowledge and understanding of processes and disciplines in the creative industries sector; practical, technical and transferable skills; oral, written and evaluation abilities; resource management; problem solving and planning; and organisational and communication skills. This qualification covers areas such as: career paths, job roles and the responsibilities of those working within the creative industries; the generic skills and attitudes valued by employers; storytelling techniques (traditional and emerging techniques); the key elements of the creative process (media platforms, media commissioning, audience research and legal controls); and the structure and language of creative briefs and how they can be interpreted. NPAs are trusted because they are developed by practitioners from industry and are supported by the relevant sector skills council (SSC). The NPA in Creative and Digital Media: Technologies, Processes and Practices was developed in partnership with Creative Skillset and employers. Creative Skillset is the SSC for the creative industries. The NPA in Creative and Digital Media: Technologies, Processes and Practices at SCQF level 6 offers current, fit-for-purpose, bite-sized chunks of learning that are straightforward for centres to adopt and for learners to study. New skills can be gained quickly and cost-effectively. NPAs provide opportunities for partnership delivery that can provide benefits for partners and increase options for learners. NPAs can add value and breadth to a CV for a learner by developing vocational skills. If the NPA is being offered as part of the Foundation Apprenticeship, it is expected that learners will complete the NPA in S5 or S6. This NPA is a mandatory component in the Level 6 Creative and Digital Media Foundation Apprenticeship. Section 6.6 of the Group Award Specification document provides information on the resources needed to deliver this qualification. 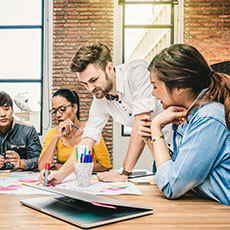 The NPA Creative and Digital Media: Technologies, Processes and Practices at SCQF level 6 consists of four mandatory Units (30 SCQF credit points). Assessment of this award will be a combination of practical and knowledge assessments under open-book assessment conditions. It is recommended that centres refer to the assessment and evidence requirements for each unit.